A week-in, weak-out study in same-y procedural storytelling and mythology stalling that's powered by the usual salacious crime exploitation and the unusual lead performance of James Spader. 938 min. NBC. Directors: Joe Carnahan, Michael Watkins, Paul Edwards, Karen Gaviola, Steven A. Adelson, David Platt, Andrew McCarthy, Donald Thorin Jr., Guy Ferland, Michael Waxman. Cast: James Spader, Megan Boone, Diego Klattenhoff, Harry Lennix, Amir Arison, Mozhan Marno, Ron Perlman, David Strathairn, Mary-Louise Parker, Peter Stormare, Alan Alda, Lance Henriksen, Janel Moloney, David Patrick Kelly, Krysten Ritter. Nothing says "vote of confidence" to a young network series than the prime post-Super Bowl berth, which also signals a Super-sized budget and the attendant bigger scale and special guest stars. For sophomore series The Blacklist, the Super Bowl episode meant a return visit from pilot director Joe Carnahan (a get from the feature-film world), a Die Hard-in-a-prison hostage drama, and new recruits David Strathairn (The Bourne Ultimatum) and Ron Perlman (Sons of Anarchy). And yet, few shows say "spinning your wheels" more than The Blacklist, a week-in, weak-out study in same-y procedural storytelling and mythology stalling that's powered by the usual salacious crime exploitation and the unusual lead performance of James Spader. Spader, of course, plays criminal mastermind Raymond "Red" Reddington, late of the U.S Navy and long one of the FBI's Most Wanted (the star also sports a co-executive producer credit). Freed on his own recognizance as a condition of his helping the FBI nab the most dangerous lawbreakers and terrorists, Reddington has a second-to-none knowledge and network of criminal contacts and a smug attitude that just won't quit. It's also possible he's irredeemable, doling out as he does unauthorized capital punishment whenever he feels like it. But he has a glaring soft spot for--and conspicuously secret history with--rookie FBI profiler Elizabeth Keen (Megan Boone), who gets a career boost when Red demands exclusive partnership with her. They're backed by an FBI team lead by Harold Cooper (Harry Lennix, who could do this part in his sleep) and comprised of Special Agent Donald Ressler (Diego Klattenhoff), tech nerd Aram Mojtabai (Amir Arison) and Mossad loaner Samar Navabi (Mozhan Marnò), a new addition that's more interesting than Cooper, Ressler, and Mojtabai combined, though that's not saying much. For yes, The Blacklist is one of those shows, like, say, Dexter, that has a fascinating central character and then...other people...over there...doing stuff...because life. The Blacklist has a fine premise on which to hang a procedural, and it's got a fine stunt crew making cars flip about, but beyond that, it's all Spader's reptilian charm. Combine those elements, and you have a show that's prime falling-asleep-to-it material for a network schedule, and The Blacklist indeed made a ratings splash in its freshman season. But the ratings went into a noticeable decline over the course of Season Two after the peak Super Bowl audience. In fact, it's almost as if the audience watched that episode, half shrugged and walked away, the other half watched the conclusion in the show's regular time slot, and then all the non-die-hard viewers began sloughing off the show, presumably thinking, "That was a Super Bowl episode. That's the best they could do? This is never going to get any better, is it?" Spader gets juicy monologues, and he caresses them like lovers, but any given monologue only takes up a couple of minutes, and then we're back to nutty villains committing nutty crimes, silly conspiracies, crazily expedient plotting where leads fall into the FBI's lap, desperately welcome guest stars (like Alan Alda), unforgiveably wasted thespians (Lennix, Mary-Louise Parker as Red's ex-wife, et al), and Keen wondering if Red cares so much about her because he's her dad. The latter "is he or isn't he?" nonsense is what passes for the show's mythology, and it's so thin that it's hard to imagine anyone caring at this point, with seasons left to traverse. In a crowded TV marketplace, with so many adult-minded shows on offer, The Blacklist is kid stuff, which is fine as far as it goes (babysitting them while introducing them to the pleasures of an actor like Spader). But for grown-ups, The Blacklist is a guilty pleasure at best, one that makes us long for the days of Boston Legal, where the procedure was two actors (Spader and William Shatner) wrestling for the prize of biggest ham while arguing cases about hot-button social issues. Now that was entertainment. Sony delivers a fine Blu-ray release of The Blacklist: The Complete Second Season, with typically strong A/V results and a satisfying smattering of extras. Color shows variety and richness, abetted by well-calibrated contrast and black level. Detail and texture are generally excellent as well, and although I could spot a few digital artifacts when the action editing gets fast and furious with bursts of light and color, they're very few and far between. The lossless DTS-HD Master Audio 5.1 mixes are frankly awesome for a weekly network TV show, with palpable immersion that even surrounds you with workplace chatter in busy FBI control rooms. Of course, these mixes are also thunderous when it comes to the action and dynamic in musical range and fidelity. 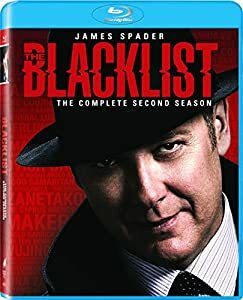 Both the Blu-ray and DVD sets include the featurettes "Raymond Reddington: Man of the World" (9:55, HD), a character analysis with story editor Brandon Sonnier, James Spader, executive producer/show runner John Eisendrath, co-executive producer/writer Lukas Reiter, executive producer/show runner Jon Bokenkamp, property master Courtney Schmidt, executive story editor Amanda Kate Shuman, costume designer Christine Bean, and story editor Brandon Margolis; and "Building a Blacklister: Vanessa Cruz" (10:10, HD) with Bokenkamp, co-executive producer/writer Daniel Knauf, Sonnier, Eisendrath, Ana de la Reguera, Reiter, Jeff Auer, Margolis, Hani Avital, and Shuman participating and an all-access pass into the Writer's Room. Exclusive to the Blu-ray set are commentaries on "Leonard Caul" and "Tom Connolly" with creator Jon Bokenkamp and executive producer John Eisendrath, a disc-by-disc selection of "Deleted Scenes" and two featurettes: "After the Game: Luther Braxton" (13:05, HD) with Bokenkamp, Spader, Knauf, Eisendrath, Shuman, Margolis, Ron Perlman, make-up Anthony Pepe, Bean, production designer Nicholas Lundy, Diego Klattenhoff, Mozhan Marno, Schmidt, Megan Boone, Sonnier, Amir Arison, visual effects supervisor Greg Anderson, NBC Entertainment Senior VP, Current Series Bruce Evans, Reiter, and Lennix going on record about the Super Bowl episode, as well as glimpses into the Writer's Room and a studio screening room; and "Known Associates: Red's Inner Circle" (13:34, HD) with Reiter, Spader, Knauf, Hisham Tawfiq, Bokenkamp, Margolis, Eisendrath, Susan Blommaert, Sonnier, and Shuman discussing the quirky supporting players who pop up to help Red. All site content © 2000-2019 Peter Canavese. Page generated at 04/17/2019 10:49:32PM.